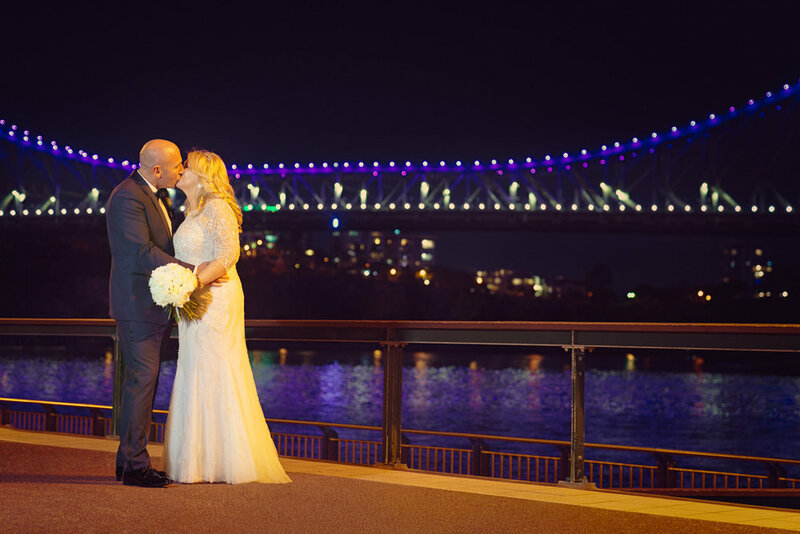 We had the pleasure of shooting a wonderfully prepared wedding in Brisbane for Michael & Jo. Venue location being at Blackbird Private dining and Events, located on Eagle St Pier, situated on the Brisbane river with a backdrop of the Story Bridge. it is well known as Brisbane's favourite riverside venue. 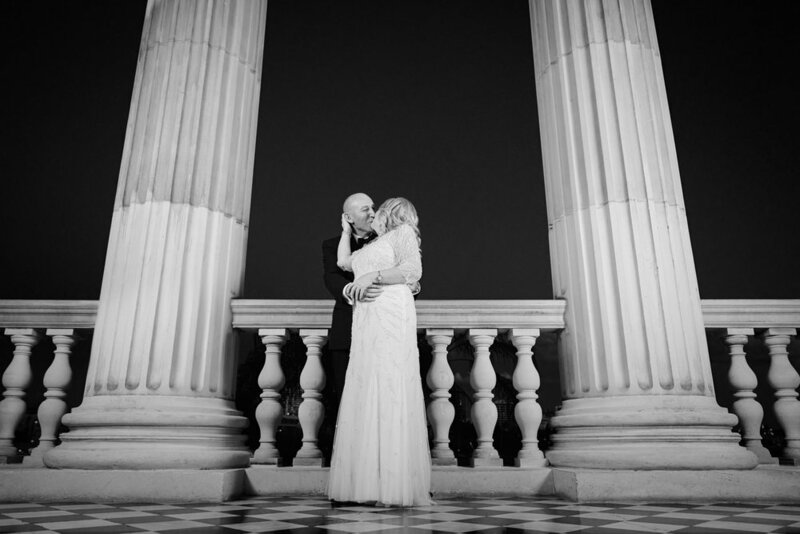 There’s no disagreeing that the view from the venue is breathtaking & an amazing choice made by both bride & groom. Starting the day off with the beautiful bride Jo, we meet at her home, just 10 minutes from the venue, a beautiful house filled with spectacular artwork & a winding staircase that made for some beautiful images. Taking a few shots of Jo’s stunning dress, it wasn't long before it was time to get dressed & begin the journey. Looking beautiful with hair by Envy Hair Culture-Teneriffe & makeup by the amazingly talented Makeup Artists/Stylist-Hearts and Heroes this wonderful team also took care of the wedding planning/styling along with Stem Design & what an amazing combination! The ever talented designer, Shannon Pittman at Bo and Luca designed the ivory heirloom gown with hand embroidered detailing of pearls, beads & crystals. It was just perfect. In no time the Bentley had arrived to take the bride & her bridesmaid to Blackbird & it was time for Jo to marry the man of her dreams. Everyone heading over to the venue meant the excitement was flowing effortlessly. Arriving at Blackbird, we were ready to go, cameras covering all angles & with guests seated it was nearly go time. Michael patiently waiting for his soon to be wife, you could see the smile on his face wasn't going anywhere. Finally the moment we had all been waiting for arrived, as Jo walked through those doors & down the red carpet towards awaiting family & guests, there was nothing but smiles & tears of joy flowing. Not to mention Michael, he looked to be the happiest man alive. Making her way down the isle everyone stared at just how gorgeous Jo looked...words couldn't begin to describe. The ceremony continued to move along smoothly, as heartfelt words were spoken and two became one, it was nothing short of the perfect moment for both Michel & Jo. Walking back down the isle as husband & wife it was time to get started on the photos section. Starting it off with a huge group photo then heading down to Custom’s House this made for some AMAZING images, with the detailed building in the background it was just magnificent. Making our way over to the balcony overlooking the Brisbane river we were very pleased with all the moments captured. Doing a little more exploring we were beside the Brisbane river with the beautiful Story Bridge filling the background with its colourful lights, this made for some more spectacular images. In no time it was time to head back to Blackbird to continue the celebrations. Arriving back at the venue we snuck some quick portrait shots in by the entrance taking full advantage of this wonderful venue. Soon enough everyone was seated & it was time to relax and have a little something to eat whilst listening to the fabulous band, Rush. We just have to say their music was just beautiful & such a pleasure to listen to. Shortly after the first course had been served it was time for speeches. After some heartfelt words, a wonderful painting was revealed by talented bridesmaid, Tracey Keller, which might I just add was AMAZING! The food was amazing and now it was time to cut the cake that was made by the award Winning, A Little Cake Place, it was embellished with Swarovski crystals & topped with a Tiffany bow. The groom & his bride made their way to the dance floor for the bridal dance & before long it was filled with all the guests having a blast & with us snapping away we caught all the good stuff. It was nearly time for us to depart, saying our goodbyes & packing up the gear we went to wish Michael & Jo all the best for their future together & a safe trip to France for their honeymoon. We wish Michael & Jo happiness and a life filled with love & joy. From the team here at J'adore, Congratulations.